Keeping our feet safe and healthy both at work or at play is a key component in living a healthy life. What can we do at our workplaces to keep our hard-working feet in top shape? Make comprehensive foot protection part of your safety program. Conduct a hazard assessment of your worksite(s). 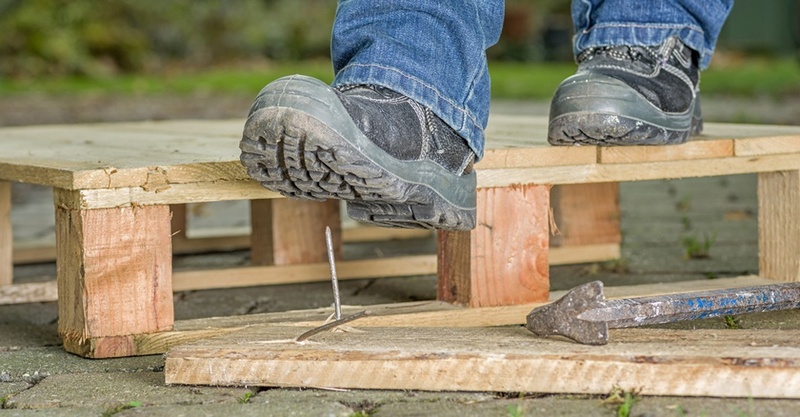 Sometimes simply redesigning the worksite or the way tasks are performed is the best way to reduce dangers to the feet. Consider simple changes such as installing anti-fatigue floor mats and allowing workers to frequently rotate jobs to give their feet a break. Know your shoes or work boots. Each pair of safety footwear has a code that is printed, stamped, or stitched onto one of the shoes. This label identifies the type of protection the shoes provide. In addition to size, the label tells you which federal standard or section of a standard the shoes comply with, their compression and metatarsal resistance measurements, whether they have a reinforced toe, and more. Get the right fit. The best time to buy new shoes is at the end of a workday when your feet have swollen to their largest size. Throughout life, the average adult’s foot will change size four or five times, so before picking out new shoes always have your feet measured. Be aware that people often have one foot that is larger than the other – if this is true for you, select shoes that fit your longest foot correctly. If you wear heavy socks, orthotics, or cushioning insoles at work, wear them while testing the fit – otherwise, these could make a comfortable pair of shoes too snug. Inspect your footwear daily to ensure it provides adequate protection. Before putting on safety boots, check them over for cuts, cracks, or holes, and look for separation between the upper part of the boot and the sole – any damage of this type can diminish the footwear’s protective qualities and make the feet vulnerable to injury. Make sure straps, buckles, and laces are in good condition, and replace them if they are not. Turn the shoes over and inspect the soles for pieces of metal or other embedded material that could cause a trip hazard or make the wearer vulnerable to a dangerous electrical exposure. Nonskid soles should be checked for tread wear that can diminish the ability of the shoe to “grip” a walking surface. Feet can be injured by regular “wear and tear”, particularly when standing for long periods of time. Providing the feet cushioning and movement can help prevent problems. Wood, cork, carpeting, and rubber flooring are easier on the feet than bare cement, but they are not always practical. Using footwear with an insulated sole, and placing shock-absorbing insoles inside a shoe, can help reduce impact and increase comfort. Before a shift begins, you can use simple stretching exercises to prepare the muscles and tendons of your feet for long periods of standing. Need more training for all those vulnerable feet and hands and eyes at your place of business? Summit can help! Check out our catalog of courses today.